FFWPU Thailand: Dr. and Mrs.Lek‘s tribe continue to invest Tribal Messiah at mountain area of Hmong Tribe, in central Thailand. 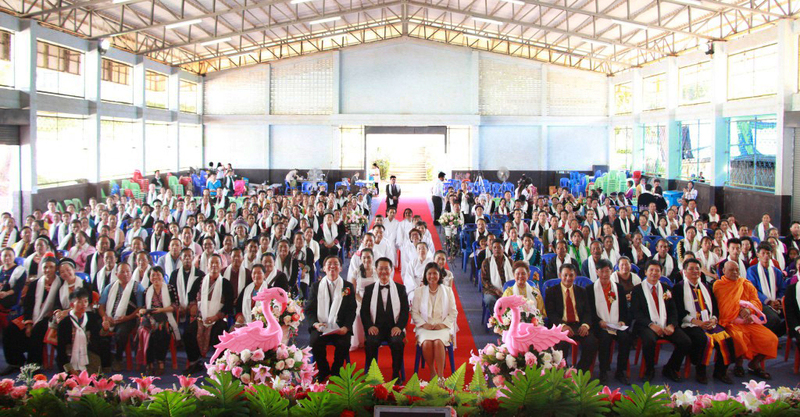 As a result on December 07, 2014 we had an “Interfaith Peace Families Blessing Festival, for this tribe in School Ban Keg Noi Hall Phetchabun Province , Thailand, and 210 couples participated. Hmong tribe is in the south of China, Vietnam, Laos and Thailand; During cold war in Indochina, many of them had to emigrated to USA and third countries; Hmong has known as the tribe who is hard working people, having many children & strong family value, they keep their own language, custom and tradition very well wherever they emigrate. Hmong people were so happy with our teaching and Blessing ceremony, and many of them accepted to do the 40-day separation and 3-day ceremony. They also want to hold the Blessing ceremony again in other area of their tribe in Thailand or even in USA.